I saw this cake as an ad for Kraft Food & Family online (I already subscribe to the magazine - it's free!) and I HAD to go online to find out how to do it. My husband LOVES pumpkins. He say's they are peaceful and happy. In fact, he loves them so much, we have pumpkin pillows, a pumpkin rug, a pumpkin cookie jar, teapot, soup tureen, fruit bowl, salt & pepper shakers...we have a lot of pumpkins in this house. And they aren't jack-o-lanterns. They are unaltered pumpkins. We didn't buy all of it ourselves, some were gifts. 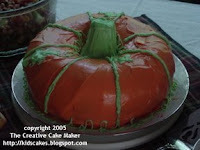 Right around Halloween of last year, I was flipping through my Food & Family Magazine when I saw a picture of this great pumpkin cake. My husbands 40th birthday was coming up (in 8 more months) and what could be a better cake for him than a pumpkin! I wasn't much of a cake decorator. I had managed to throw together cakes for my kids birthdays and I never heard many complaints, but I like to have a "wow" factor at birthday parties. This cake is basically a bundt cake with an ice cream cone upside-down in the top hole. (It's a cake cone, not a sugar cone). Ice the cake then place the cone in the top and ice the cone. Update 4/02/2014: The Kraft Food & Family Magazine is no longer offered as a free subscription but I found the cake on their website...the Great Pumpkin Cake.